Jear and I decided to divide the styling. We didn't have any specific peg in mind for each outfit. We just did our mixing and matching right then and there. I wasn't that comfortable while shooting, maybe because it's a big shoot and I have never worked with most of the people in the team before except Jear. Thanks bessy for always asking if I'm okay and for all the words of encouragement. :) Love you! So,ciao! Back to watching Bob's Burgers and American Idol. Heh. nice pictures and great styling too. You did an amazing job with the styling. Keep up the good work. Oh my! 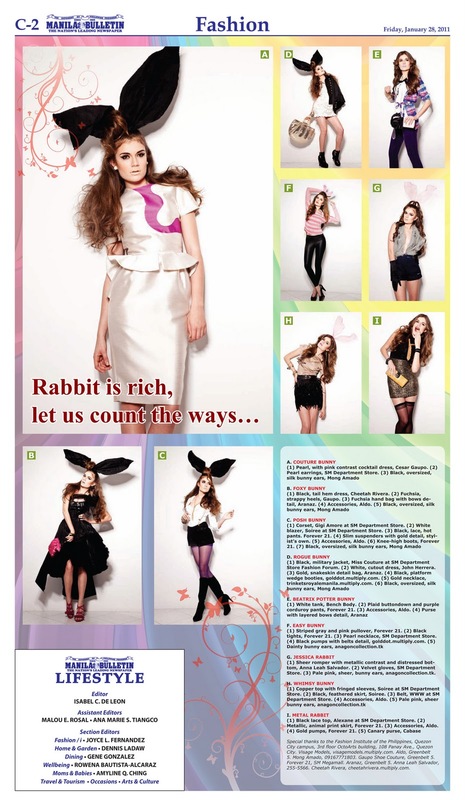 What a fun pictorial, loved all the outfits, accessories and all are just perfect, I'd wear bunny ears just a little bit smaller ones, great inspiration! omg i loooooove this! good job styling babe! its sooooo fabulous!!!!! tomorrow, imma wear bunny ears when i go out of the house.